The shift from European exploration to colonization in Arkansas began in 1686 when Henry de Tonty left Jean Couture and five others in charge of a small trading post near the Quapaw village of Osotouy. This place, in time, came to be known as Arkansas Post, and this event marked the beginning of a continuous written record on Arkansas history. To commemorate the Tricentennial of the founding of Arkansas Post, the Arkansas Archeological Survey (ARAS) in 1986 hosted a symposium called “Arkansas Before the Americans.” Held on the University of Arkansas-Little Rock campus, with financial support provided by the Winthrop Rockefeller Foundation, the symposium was moderated by Hester A. Davis, with Judge Morris S. Arnold serving as discussant. As a further commemoration, the Old State House Museum put on a special exhibit entitled Arkansas Post: The Beginning. Following the symposium’s conclusion, ARAS published the presented papers along with three additional contributions as Arkansas Before the Americans, edited by Hester A. Davis (Arkansas Archeological Survey Research Series No. 40, 1991, now out of print). As Morris S. Arnold notes in his introductory essay, the scant published literature addressing Arkansas Post and its impact on later events made this a most welcome volume, particularly if it served to stimulate further study of Native Americans during the colonial era. Symposium participants addressed topics using both archeological and historical research. John H. House presented information on private collections of Native American vessels from the Arkansas Post locality that improve our understanding of cultural sequences during the Mississippi period (ca. AD 900 – 1600) preceding the French presence. Dan F. Morse summarized additional archeological evidence to argue for development of historic Quapaw Indians from local antecedents. Michael P. Hoffman, in an essay contributed to the published volume, marshalled archeological and documentary evidence in support of a counter argument that Quapaws are late arrivals to eastern Arkansas. In another contributed essay, Judge Arnold corrects misinterpretations about presence of 18th century German colonists at Arkansas Post. 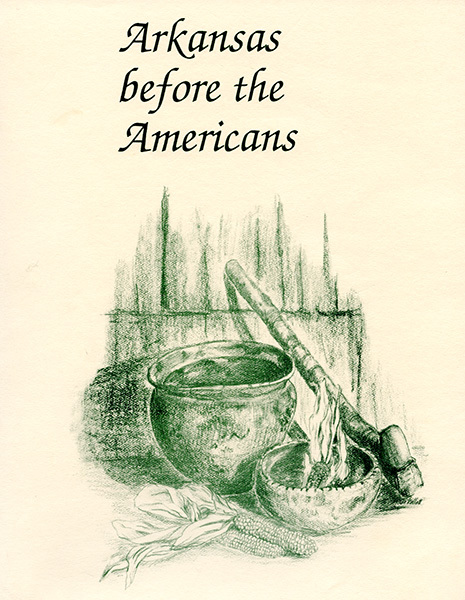 In a comparable vein, Patricia Galloway provided a fine reading of primary source materials to reconstruct roles played by Couture and Tonty as French and English colonists vied for control of trade with Quapaws and other Mississippi Valley tribes. Samuel D. Dickinson’s presentation examined the range of indigenous and introduced religious performances enacted at Arkansas Post, and George Sabo contributed further comments on French-Quapaw relations. Arkansas Before the Americans provides important substantive contributions, and the volume indeed stimulated important new research. Perhaps the foremost example is the collaboration between the Quapaw Tribe and ARAS that resulted in excavations supervised by Dr. House at the Wallace Bottoms site, leading to much new evidence concerning Quapaws in colonial Arkansas (House 2013). Equally important is new historical research represented by such works as Arnold’s Rumble of a Distant Drum (Arnold 2000). 2000 Rumble of a Distant Drum: The Quapaws and Old World Newcomers, 1673-1804 (University of Arkansas Press, Fayetteville).